Meet Jabari, our new potto! 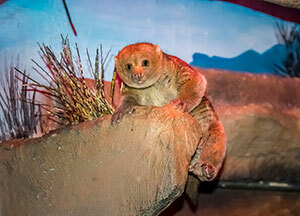 Jabari comes to us from the Cleveland Zoo, and joins our current potto, female Kiazi. After being rejected by her mother as a baby, Kiazi was hand-raised by keepers and has shared her exhibit with our springhaas, Gikuyu, for companionship ever since. Although Kiazi and Jabari seem to be hitting it off, the same can’t quite be said for Jabari and Gikuyu. Gikuyu—also a male—seems to be having a bit of healthy “alpha male” competition with Jabari over Kiazi. In addition, a bushbaby—female, Kirby—shares this three-exhibit space, making this the only mixed-species exhibit in the Small Mammals building. As you can imagine, with two pottos, a springhaas and a bushbaby, this is quite a busy space with lots of activity for visitors to enjoy. Zookeepers report that Jabari is curiously exploring his new digs. One keeper describes pottos as the “Spiderman” of the small mammals—with impressive range-of-motion in their joints and extreme grip strength that allow them to climb just about anywhere and contort themselves into almost unnatural-looking positions. Pottos also have a number of adaptations that enable them to protect themselves from predators, such as shield-like spinal protrusions and toxic saliva used to protect their offspring. As they are nocturnal creatures that forage for food at night, they also have excellent vision in low light. Although not currently believed to be endangered, pottos are often victims of the exotic pet trade and habitat destruction resulting from human expansion and development. 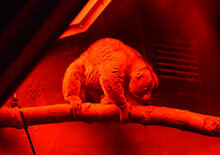 Jabari has begun displaying scent-marking of Kiazi, a common courting ritual for pottos. Although a bit averse to this behavior initially, Kiazi doesn’t seem to mind it any longer. It is the Zoo’s hope that Jabari and Kiazi will eventually breed, but time will tell. Stop by the Small Mammals building to watch Jabari interacting with Kiazi, Gikuyu and Kirby in this mixed-species exhibit.